Was Back To The Future a coded warning about the 9/11 attacks? With his 1985 time travel comedy Back To The Future, was director Robert Zemeckis trying to warn humanity about the 9/11 terrorist attacks a full 16 years before they happened? “Of course not,” most people would say. “That’s ridiculous. Please leave me alone.” But an unsettling video by YouTuber BarelyHuman11 suggests otherwise. “Back To The Future Predicts 9/11” is a spookily committed, 12-minute presentation that attempts to prove that the seemingly innocent film is actually chockablock with coded references to the collapse of New York City’s twin towers. 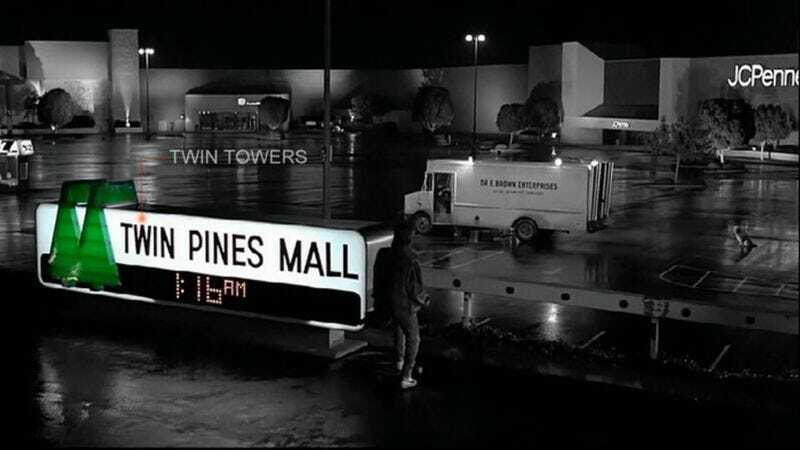 Interestingly, the clip is attributed to Aprophenia Productions, whose name means “tendency to perceive meaningful patterns within random data.” Much of the video centers around the film’s crucial location of the Twin Pines Mall, which itself is the site of a Muslim terrorist attack. Get it? Twin Pines? But then there are all the iterations of the numbers “9/11” scattered throughout the film and its sequel, plus the fact that Michael J. Fox gives Christopher Lloyd a written warning that he says will make sense “in 30 years.” Cut to 30 years later, and what is Zemeckis doing? Releasing a movie called The Walk, which is about the twin towers and which features Joseph Gordon-Levitt dressed very much like Michael J. Fox did in Back To The Future Part II. It almost seems plausible for a second or two. It is difficult, upon first viewing, to judge exactly how sincere BarelyHuman11 is with this video. Initially, it seems to be a pitch-perfect parody of such classic YouTube “fan theory” videos as “The Shining Code,” which posits the wacky theory that Stanley Kubrick’s The Shining is actually about NASA faking of the moon landing. But BarelyHuman11 has a whole slew of other Back To The Future conspiracy videos along similar lines, including one about the Kennedy assassination, and there is precious little levity in his voice as he narrates. If this video is indeed intended as very dark comedy, then its creator is to be commended on his extreme satiric discipline. The best evidence that this is all hogwash comes near the end, when the narrator pretty much stops discussing Back To The Future altogether and goes off on a weird tangent about the movie screen being a portal or something, somehow dragging The Wizard Of Oz and 2001: A Space Odyssey into the mix.